The first few days of the Low FODMAP Diet can be frustrating. There are so many things to remember that looking at recipes can feel exhausting all on its own. Then you have to find the energy to get the food and put it together. This is one of the reasons I recommend this low FODMAP spicy pasta sauce to beginners. Don’t let the title scare you. I have the taste buds of a 4-year-old, so this recipe is pretty tame as far as “spicy” goes. If you’re still worried, you can always cut the spices in half. I like this recipe in particular because it’s ready in under 30 minutes. Since I normally have these ingredients on hand, it’s an easy meal idea when I’m in a pinch. As a bonus, the sauce can be frozen in individual portions. I normally keep one or two servings in my freezer for emergencies. If that sounds great, but you don’t have time to look at it now, you can PIN IT for later. 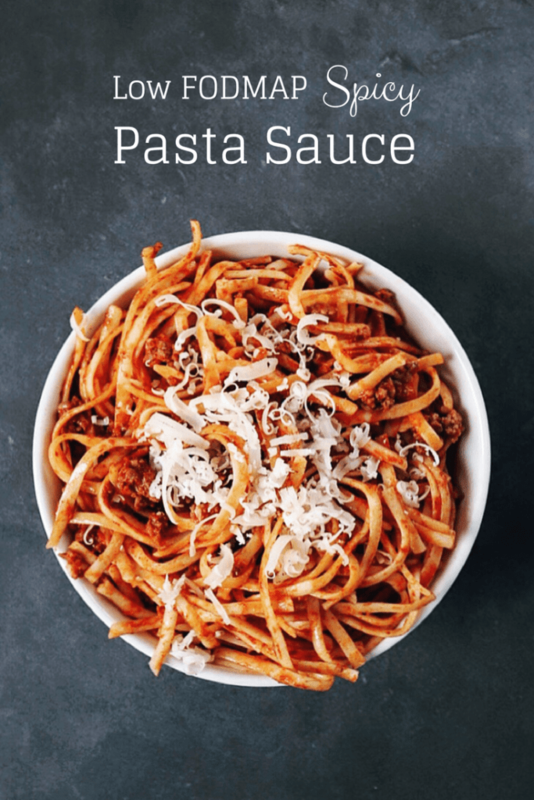 You’re going to love this low FODMAP spicy pasta sauce. 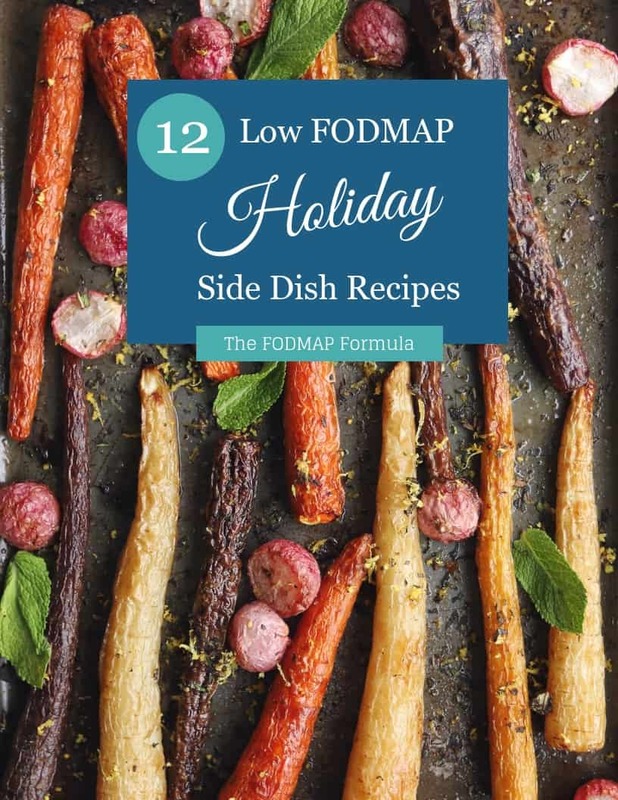 Check out the notes below for some handy tips on keeping this recipe FODMAP friendly. First, Monash University recommends limiting canned tomatoes to 1/2 a cup (or 92 g) per sitting. 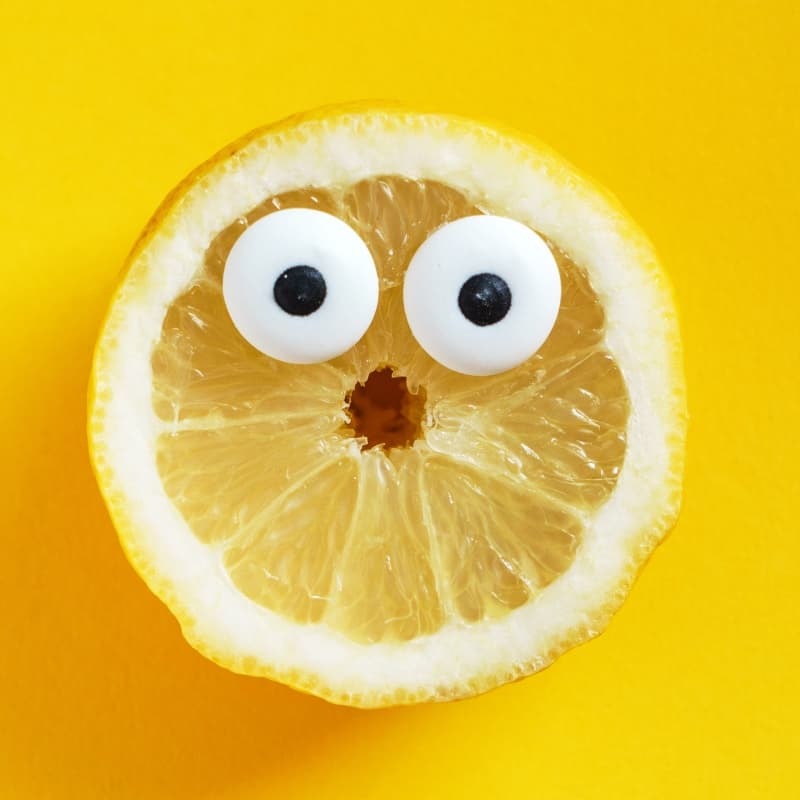 Servings of 3/4 cups or more can be high in the FODMAP fructan. This means you’ll need to keep an eye on your serving size. This recipe serves 4 people. As long as you manage your portion, you’ll fall within the recommended serving size. Next up is pasta. According to the Monash app, 1 cup of gluten-free pasta per sitting is low FODMAP. Yes, this includes seconds. Servings of 1.5 cups or more can be high in the FODMAP fructan. When I’m hungry, my eyeballs tend to lie shamelessly; so I would recommend physically measuring your pasta before you dig in. Finally, if you like your pasta with a side of cheese, you’re in luck. Hard cheeses like parmesan or asiago have most of their lactose broken down during the cheese making process. This makes them FODMAP friendly during the elimination phase as long as you stick to a “green” serving size. According to the Monash app, you can have up to 1/2 a cup of parmesan per sitting. That should be more than enough. You may have noticed that a safe portion of pasta is kind of small. I solve this problem with side dishes. My husband and I like to pair this pasta recipe with a fresh garden salad. You can also go a little crazy and make yourself some fresh low FODMAP garlic bread. Think this sounds doable? Don’t forget to PIN IT so you can give it a try. 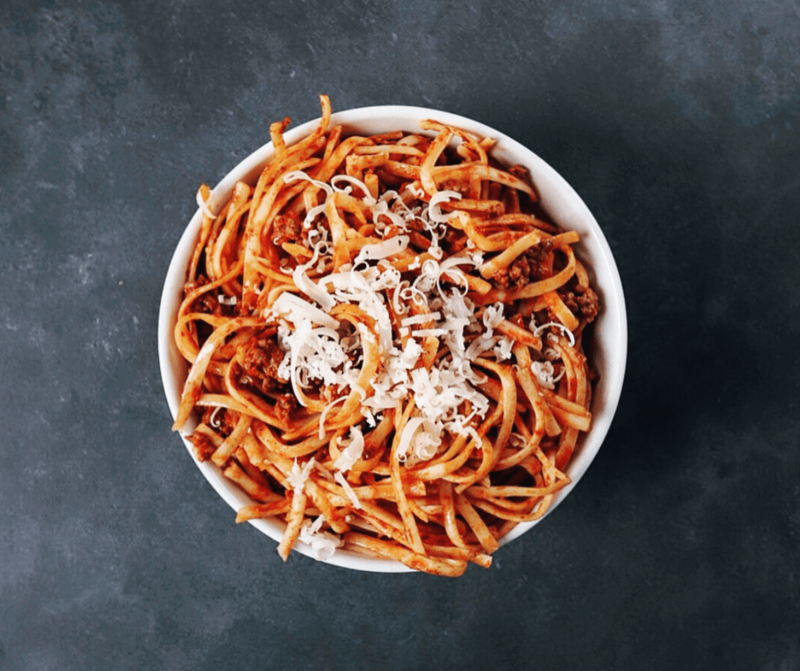 A delicious alternative to traditional spaghetti bolognese. Use whatever kind of gluten-free pasta you have on hand, and enjoy! Heat both oils together in a frying pan. Add ground beef and cook until browned (break it up as small as you can). Once meat is cooked through, add tomato puree, cayenne powder, chili powder, and salt and pepper. Stir thoroughly and leave to simmer (stirring occasionally). Fill a large pot with water and bring to a boil. Cook pasta according to instructions. Once pasta is cooked, remove from pot with a slotted spoon and place it directly in the sauce (do not drain). Stir to coat pasta and allow to sit for 2-3 minutes to absorb the flavour of the sauce. Plate pasta and top with parmesan and any additional sides. Enjoy! Don't forget, you can freeze the sauce! To do this, remove the portions of sauce you want to freeze and put them aside before adding the pasta. Allow it to cool down overnight in the fridge before you put it in a freezer safe container to avoid pre-mature freezer burn. 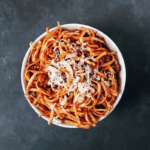 This low FODMAP spicy pasta will be a family favourite in no time. If you like this recipe, sign up for my mailing list below. You’ll get new low FODMAP recipes and articles delivered right to your inbox.